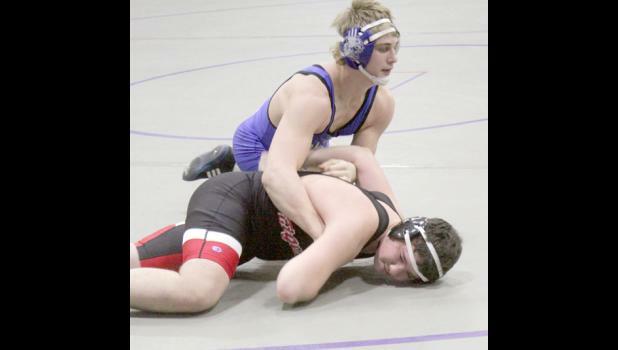 The Big 7 League wrestling tournament was held on Feb. 8 at Royal Valley. The Holton Wildcats were crowned the Big 7 League Champs for the fourth consecutive year. 1. Holton 193 points 2. Sabetha 128 points 3. Perry-Lecompton 110.5 points 4. Riverside 86.5 points 5. Royal Valley 60 points 6. Jeff West 33 points. 106 - Jake Barnes (31-6) placed 1st and scored 20.0 team points. Round 1 - Jake Barnes (Holton High School) 31-6 won by fall over Cameron Harrell (Sabetha High School) 10-22 (Fall 0:51). Round 2 - Jake Barnes (Holton High School) 31-6 won by fall over Marshall Cowan (Jeff West High school) 11-22 (Fall 0:27). Round 3 - Jake Barnes (Holton High School) 31-6 won by fall over Dalton Kahle (Perry-Lecompton High School) 13-11 (Fall 3:14). 113 - Lucas Adcock (23-11) placed 1st and scored 18.0 team points. Round 2 - Lucas Adcock (Holton High School) 23-11 won by fall over Christopher Brooke (Riverside High School) 3-21 (Fall 0:19). Round 3 - Lucas Adcock (Holton High School) 23-11 won by fall over Mason Bahnmaier (Perry-Lecompton High School) 14-11 (Fall 3:21). 120 - Cayden Jackson (23-12) placed 1st and scored 18.0 team points. Round 2 - Cayden Jackson (Holton High School) 23-12 won by fall over Judson Mathis (Royal Valley High School) 0-2 (Fall 0:51). Round 3 - Cayden Jackson (Holton High School) 23-12 won by fall over Austin Geeting (Riverside High School) 17-13 (Fall 1:10). 126 - Slater Skaggs (17-24) placed 2nd and scored 14.0 team points. Round 1 - Slater Skaggs (Holton High School) 17-24 won by fall over Kolten Jackson (Riverside High School) 8-12 (Fall 1:12). Round 2 - Kaden Dillon (Sabetha High School) 16-4 won by fall over Slater Skaggs (Holton High School) 17-24 (Fall 4:25). Round 3 - Slater Skaggs (Holton High School) 17-24 won by fall over Bryar Barnett (Royal Valley High School) 1-2 (Fall 1:01). 132 - Kolby Roush (33-5) placed 1st and scored 18.0 team points. Round 1 - Kolby Roush (Holton High School) 33-5 won by fall over Braden Mitchell (Sabetha High School) 10-21 (Fall 1:17). Round 3 - Kolby Roush (Holton High School) 33-5 won by fall over Beau Horn (Riverside High school) 27-5 (Fall 0:44). 138 - Conner Gilliland (11-24) placed 2nd and scored 14.0 team points. Round 1 - Conner Gilliland (Holton High School) 11-24 won by fall over Hunter Thelen (Jeff West High School) 17-23 (Fall 0:58). Round 2 - Thad Metcalfe (Perry-Lecompton High School) 23-8 won by fall over Conner Gilliland (Holton High School) 11-24 (Fall 3:22). Round 3 - Conner Gilliland (Holton High School) 11-24 won by fall over Micheal Gugelman (Sabetha High School) 7-18 (Fall 1:48). 145 - Trevor Bowser (10-16) placed 4th and scored 4.0 team points. Round 1 - Kamden Brownlee (Sabetha High school) 22-6 won by major decision over Trevor Bowser (Holton High School) 10-16 (MD 13-0). Round 2 - Luke Horn (Riverside High School) 29-4 won by fall over Trevor Bowser (Holton High School) 10-16 (Fall 1:42). Round 3 - Mitchell Root (Perry-Lecompton High School) 6-12 won by tech fall over Trevor Bowser (Holton High School) 10-16 (TF-1.5 3:04 (20-1)). 152 - Cael Jackson (32-7) placed 1st and scored 24.0 team points. Quarterfinal - Cael Jackson (Holton High School) 32-7 won by fall over Leevi Wells (Riverside High School) 7-17 (Fall 0:48). Semifinal - Cael Jackson (Holton High School) 32-7 won by fall over Colby Tinklin (Sabetha High School) 15-10 (Fall 4:52). 1st Place Match - Cael Jackson (Holton High School) 32-7 won by fall over Grant Roush (Perry-Lecompton High School) 12-6 (Fall 0:57). 160 - Jon Heinen (7-11) placed 3rd and scored 9.0 team points. Round 1 - Walker Lowdermilk (Sabetha High School) 24-4 won by fall over Jon Heinen (Holton High School) 7-11 (Fall 1:17). Round 2 - Kinstin Juhl (Riverside High School) 26-5 won by fall over Jon Heinen (Holton High School) 7-11 (Fall 0:50). Round 3 - Jon Heinen (Holton High School) 7-11 won by fall over Curtis Wathen (Royal Valley High School) 0-3 (Fall 0:26). 170 - Jordan Huntington (17-18) placed 3rd and scored 7.0 team points. Round 1 - Bryce Garrison (Royal Valley High School) 2-0 won by decision over Jordan Huntington (Holton High School) 17-18 (Dec 11-6). Round 2 - Joel Scott (Jeff West High School) 33-2 won by fall over Jordan Huntington (Holton High School) 17-18 (Fall 1:08). 182 - Konnor Tannahill (33-3) placed 1st and scored 20.0 team points. Round 1 - Konnor Tannahill (Holton High School) 33-3 won by fall over Eli Martin (Jeff West High School) 9-20 (Fall 1:22). Round 2 - Konnor Tannahill (Holton High School) 33-3 won by fall over Kylie Meredith (Sabetha High school) 7-15 (Fall 0:15). Round 3 - Konnor Tannahill (Holton High School) 33-3 won by fall over Grant Shaver (Perry-Lecompton High School) 12-11 (Fall 2:30). 195 - Dustin Chermok (16-10) placed 2nd and scored 12.0 team points. Round 2 - Dustin Chermok (Holton High School) 16-10 won by fall over Casey Williams (Sabetha High School) 3-9 (Fall 1:14). Round 3 - Kaedin Juhl (Riverside High School) 20-11 won by tech fall over Dustin Chermok (Holton High School) 16-10 (TF-1.5 5:06 (17-1)). 220 - Henry Katz (11-18) placed 4th and scored 8.0 team points. Quarterfinal - Henry Katz (Holton High School) 11-18 won by fall over Aaron McGrath (Jeff West High School) 6-21 (Fall 3:43). Semifinal - Cauy Rokey (Sabetha High School) 17-1 won by fall over Henry Katz (Holton High School) 11-18 (Fall 0:41). Cons. Semi - Henry Katz (Holton High School) 11-18 received a bye. 3rd Place Match - William Kralicek (Royal Valley High School) 2-1 won by fall over Henry Katz (Holton High School) 11-18 (Fall 2:20). 285 - Drew Morris (8-26) placed 3rd and scored 7.0 team points. Round 1 - Collin Rossillon (Perry-Lecompton High School) 17-11 won by fall over Drew Morris (Holton High School) 8-26 (Fall 0:38). Round 2 - Elliot Strahm (Sabetha High School) 25-0 won by fall over Drew Morris (Holton High School) 8-26 (Fall 0:14). 120 - Judson Mathis (0-2) placed 3rd and scored 7.0 team points. Round 1 - Austin Geeting (Riverside High School) 17-13 won by fall over Judson Mathis (Royal Valley High School) 0-2 (Fall 0:54). 126 - Bryar Barnett (1-2) placed 3rd and scored 9.0 team points. Round 1 - Kaden Dillon (Sabetha High school) 16-4 won by fall over Bryar Barnett (Royal Valley High School) 1-2 (Fall 0:29). Round 2 - Bryar Barnett (Royal Valley High School) 1-2 won by fall over Kolten Jackson (Riverside High School) 8-12 (Fall 2:19). 152 - Karsen Smith (19-8) placed 3rd and scored 12.0 team points. Quarterfinal - Karsen Smith (Royal Valley High School) 19-8 received a bye. Semifinal - Grant Roush (Perry-Lecompton High School) 12-6 won by decision over Karsen Smith (Royal Valley High School) 19-8 (Dec 3-2). Cons. Semi - Karsen Smith (Royal Valley High School) 19-8 won by fall over Leevi Wells (Riverside High School) 7-17 (Fall 0:09). 3rd Place Match - Karsen Smith (Royal Valley High School) 19-8 won by fall over Colby Tinklin (Sabetha High School) 15-10 (Fall 3:19). 160 - Curtis Wathen (0-3) placed 4th and scored 4.0 team points. Round 1 - Kinstin Juhl (Riverside High School) 26-5 won by fall over Curtis Wathen (Royal Valley High School) 0-3 (Fall 0:33). Round 2 - Walker Lowdermilk (Sabetha High School) 24-4 won by fall over Curtis Wathen (Royal Valley High School) 0-3 (Fall 0:44). 170 - Bryce Garrison (2-0) placed 1st and scored 16.0 team points. Round 3 - Bryce Garrison (Royal Valley High School) 2-0 won by fall over Joel Scott (Jeff West High school) 33-2 (Fall 5:23). 220 - William Kralicek (2-1) placed 3rd and scored 12.0 team points. Quarterfinal - William Kralicek (Royal Valley High School) 2-1 received a bye. Semifinal - Hayden Robb (Perry-Lecompton High School) 12-2 won by fall over William Kralicek (Royal Valley High School) 2-1 (Fall 0:14). Cons. Semi - William Kralicek (Royal Valley High School) 2-1 won by fall over Aaron McGrath (Jeff West High School) 6-21 (Fall 2:38).